That’s a big phrase, Punctuated Equilibrium. I promise this could be a life changing mindset. At Rollins College, we had a thing called J Term, where we took a course in January that was completely outside of your major. One year, I took evolutionary biology. That was the class that brought about the “A-Ha” moment. Everything I was learning fit together. For the most part, everything we do – economics, psychology, marketing, art – is a function of evolution of life, an amplified ripple coming out from our primordial past. 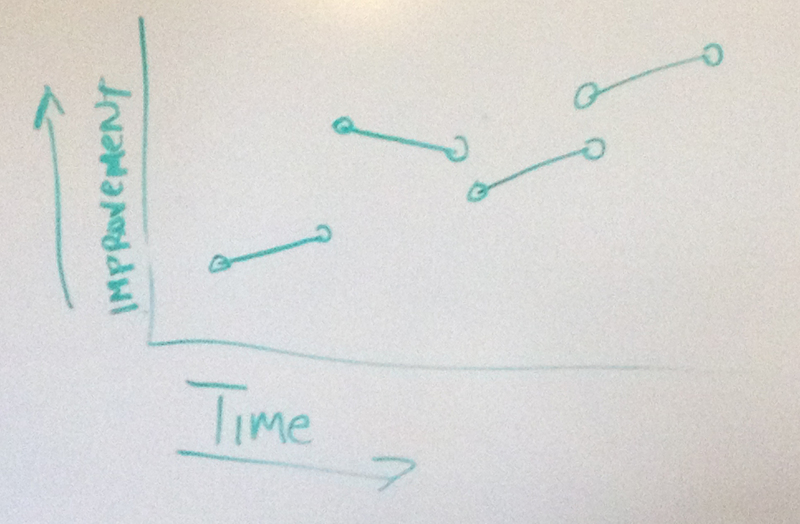 Punctuated Equilibrium was one of the bigger concepts I learned in that class, and it has stuck with me. Now I see it everywhere. One internal logical fallacy is we believe in a smooth curve of evolution of anything. 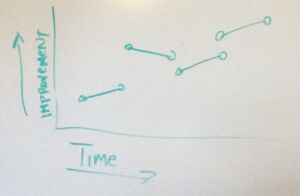 Things improve gradually or quickly, but always in a curve. Super Official Evolution Chart. I like to use dry erase markers. Man stood upright gradually. Many used tools gradually. You learned to walk gradually. You learned to ride a bike gradually. However, that is not the case. It actually went from not happening to happening. Pressure built up, change happened quickly and the curve was broken. 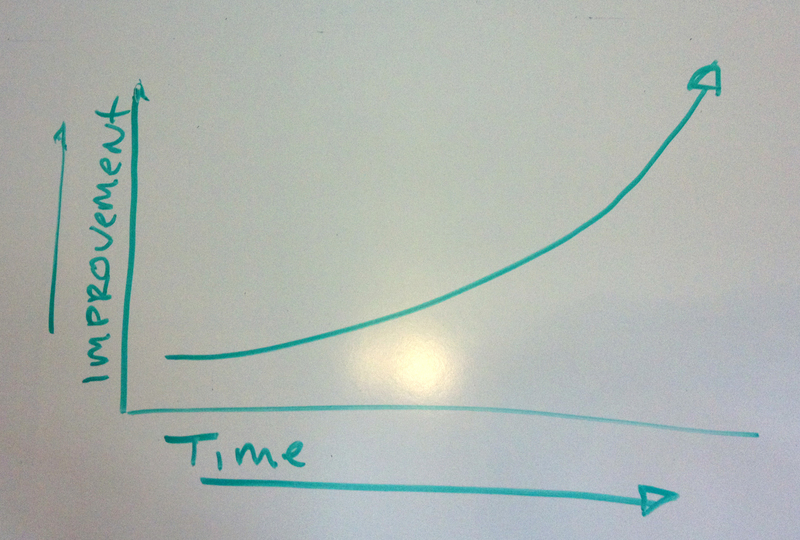 Evolution of anything is flecked with these moments of “happening” i.e. punctuated equilibrium. When we look at the Origins of Life and the fossil record, there are simply moments where everything changed. There are mass extinctions. Defined moments where all life changed. You will start to see it in marketing, too. Anywhere you see an “overnight sensation,” you will find a punctuated equilibrium. Now look back on your life. Just like my realization of this, I am sure there are moments when you suddenly “got it.” Whether it was calculus or tying your shoe or riding a bike, you went from not being able to do it to being able to do it. Of course you did get better, but the amount of punctuated equilibrium was a moment of “off the charts” change. 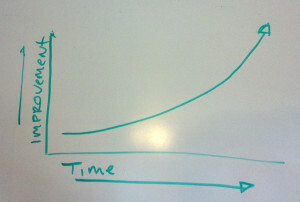 The curve of improvement broke and started someplace else. What Does Evolution Have to Do With Marketing? So what does this have to do with your marketing? Everything. We like to think, “If I invest $1,000 dollars in this I should get 1/100th the result as if I invest $100,000 dollars in this channel.” That is wrong. As Malcolm Gladwell elaborated excellently in his seminal book, The Tipping Point, marketing goes from not working one day to suddenly spreading like wildfire. So, $1000 invested in a website may yield nothing, but $100,000 may yield $1,000,000 or even $10,000,000. 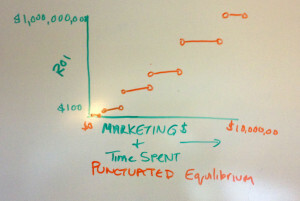 So where does punctuated equilibrium lie in your marketing? You will never know until you find it. That is why a 1 to 1 return on marketing investment is great. 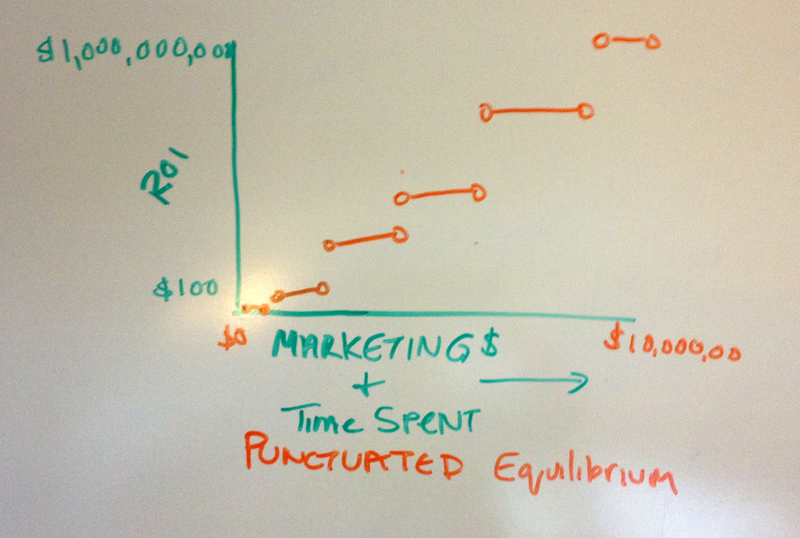 A 1:1 return on investment allows you to keep hunting for that punctuated equilibrium. If you find any marketing initiative with more than a 1:1 return, keep investing more and you will find that punctuated equilibrium. The Punctuated Equilibrium Mindset is to keep on going, stay in the game and know that if your marketing is not losing you money, it means you are getting closer to punctuated equilibrium and the next stage in your evolution in business and success.